Diving into the turbulent depths of legacy and memory, “Space Shuttle in the Garden”—Petrit Halilaj’s first solo exhibition in Italy—is a noteworthy exploration of resurfacing national and personal trauma, and a vivid investigation of the potential for artistic storytelling to mend political, social, and familial rifts. At the core of the show—in both conceptual and physical terms—is a house, or at least the skeleton of a house: a three-dimensional wooden blueprint originally erected by Halilaj’s parents as part of the process of rebuilding their home, which was leveled during the Kosovo war of 1998-99 (the old house originally stood on a hill near Kostërrc; the new building is in Pristina, Kosovo’s capital). The structure was first exhibited at the 6th Berlin Biennale in 2010, where it served as a powerful metaphor for the artist’s own history of migration; after the war in Kosovo, Halilaj studied in Milan and now divides his life between three places (Berlin, Pristina and Bozzolo, near Mantua, in Italy). 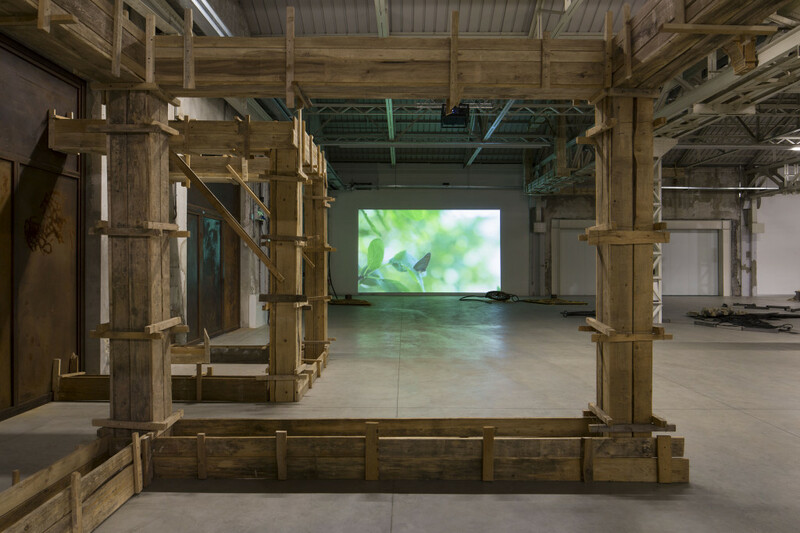 Reconfigured to fit into Pirelli HangarBicocca, the installation twists its way into the metal and concrete structure of the “Shed” gallery like ivy crawling up a trellis, and serves as both the framework and backdrop not only to the past of the artist’s family but also for his recent works. Walking in and around this not-quite-house, one can see a dozen other works by Halilaj through the hollow walls, and although many of these works have been previously exhibited, their readaptation and recontextualization lends a fresh perspective. Viewing this exhibition is a little like stepping into a View-Master filled with images from the artist’s childhood, but altered, enlarged, and distorted by time and by the prism of personal recollection. The pieces are varied, but unified by a thread of memory: there are oversized reconstructions of the jewelry that his mother buried during the war, crafted with pigments and debris from the ruins of their first house in Kostërrc; a series of several clay and brass objects modeled in the form of ocarinas found in the archeological site of Runik (not far from where the artist’s family lived); there’s a piece called 26 Objekte n’ Kumpir, from 2009, consisting in a structure of branches and earth that hides replicas of objects handmade by Halilaj’s paternal grandfather; and his signature piece They are Lucky to be Bourgeois Hens II, also from 2009, which is a rudimentary wooden space rocket (erected by friends and family using the same materials employed to build his family home) that shelters a number of living hens. Nearby is Cleopatra, a light sculpture that twirls randomly, simulating the spiraling movements of the butterflies Halilaj used to chase across fields of flowers in his childhood and, on the other side of the room, there’s a sublime video (Who does the earth belong to while painting the wind? !, 2012) showing the artist as an adult, chasing the butterflies descended from those of his memory, on that same hill where his family house once stood and where today, years later, we see that nature has taken the upper hand. At first sight, the exhibition may appear purely a meditation on forced displacement and longing, a tale of absences and impossible returns. But there are nuances to be observed. Those themes, as well as the recurrent reference to a childhood spent in a house on a hill, call to mind the works of an author whose entire oeuvre revolves around the trope of an eternal return to a collina-mammella, or hill-breast: Cesare Pavese (1908-1950), one of Italy’s most prominent twentieth-century poets and authors. Take, for example, this quote from Pavese’s The Devil in the Hills (1949), as voiced by the first-person narrator while standing in front of the house of his childhood friend, Oreste: “I thought of how many places there are in the world that belong in this way to someone, who has it in his blood beyond anyone else’s understanding.” I wonder if there’s a more perfect caption for Halilaj’s moveable home. Both the Italian author and the Kosovar artist imbued the realism of their respective narratives with clear elements of symbolism, and they both appear to believe that every person lives out a destiny preordained by personal, mythic, childhood experiences. Nonetheless, there’s a key difference in their respective credo: the protagonists of most of Pavese’s novels are moved by a desire to regain a rooted psychic identity (in the wake of the Italian Civil War of 1943-45), but are forced to confront the impossibility of this task in the face of returning to their home ground—finding their houses as they left them, but realizing their inability to ever be home. When Halilaj’s parents went back to their hill after their war, their home was burned to the ground; so they rebuilt their house, years later and in another place. Now their son travels around Europe with its shell. If, in Pavese, the past is a vivid but unapproachable presence, haunting the present like a ghost, then in Halilaj the absence (or rather, the physical disappearance) of a tangible past creates the space for reconstruction: new buildings, new interpretations, new meanings. For the artist, the past is not an unreachable spirit but rather a homemade present: there’s no room for longing, the memories are lived in the now. One of the many merits of this intelligently-orchestrated exhibition—Roberta Tenconi’s first endeavor as Curator at HangarBiccoca—is that it captures these feelings and interweaves these tropes within a cohesive narrative. If one has to find a weakness in it, is it probably that with a past that is so present there’s little room for the future. Since Halilaj has yet to turn 30 and his practice is less than ten years old, inviting him to do a solo show at Pirelli HangarBicocca is a bold and praiseworthy move. On the other hand, the quasi-retrospective gaze of his works leaves one wondering if this exhibition hasn’t missed the opportunity to look not only at where Halilaj comes from, but also at where he is heading.